Here is a huge UK domestic political story, with major ramifications for the future direction both for nuclear defence and foreign policy. It goes to the heart of Britain’s relations with the United States and with Europe. Had this been taking place against the backdrop of a Labour Government, you can guarantee that much of the Conservative supporting media would have savagely lambasted that Government for what it was engaged in. As it is, a Conservative dominated Coalition is making profound changes to Britain’s defences, yet the huge internal rows that have been taking place within it, remain largely un-reported. Two prominent liberal papers, who have had all of this drawn to their attention, have for two weeks decided not to carry any serious political analysis and commentary on it. While it may be tempting to attach some conspiracy theory to this strange abdication – the truth may be more banal. It is perhaps that they are either too parochial or simply don’t have the capacity any longer to see the bigger picture. Either way, they still sit on the article written by me, which I attach below. But then this would not be the first time the British press have been found wanting. In future we may have to come to rely on American newspapers, such as the Wall St Journal and New York Times to get to that bigger picture. It fell to the New York Times to get to the heart of the near ritual bugging and hacking into phone calls and private records by some of the UK tabloid press. It fell to the Wall St Journal to report authoritatively on this story, below – the real story behind Britain’s defence cuts, and future alliances. 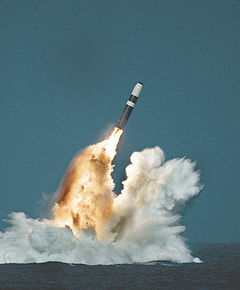 Something profound has been missing from the debate over the Governmemt’s Defence Review – namely the refusal of many of the Conservative leaning newspapers to report on the huge schism over of Britain’s nuclear deterrent that has gripped the Government – and is set to intensify with David Cameron’s announcement that the Trident renewal programme is to be delayed until 2015. That delay means that Britain will move away from being dependent on the United States for the maintenance of its nuclear submarine fleet, reduce the existing Trident fleet from four to two submarines and instead throw in Britain’s nuclear lot with the French – and by extension the Europeans. To say that the arguments have been “explosive” would be an understatement of the first order. All of this is almost designed to send the anti European, pro American British Right into the stratosphere. Already siren voices behind the scenes are urging Defence Secretary, Liam Fox to go to the political wire over Trident, although the indications seem to be that his leaked letter was as far as he is prepared to go for the moment. Former Conservative Defence Spokesman, Dr Julian Lewis MP, has already given vent to the widespread feeling of betrayal on the Tory benches, saying of the Trident delay “What is shocking is that this is clearly designed as some form of appeasement of the Liberal Democrats who are, and always have been, covert unilateralists … This is in total breach of the pledges given to Conservative MPs that the Trident replacement would go ahead if we backed the creation of the coalition.” This hasn’t stopped the anti Fox briefings from beginning, surfacing as they did recently in the Mail on Sunday. ‘Unattributed sources’ were said to be concerned at Fox’s ‘partying’ and ‘loose tongue’. Posted in: Europe, International, US & Canada, War/Defence.